For over twenty years, South Eastman Rotary Club has been solely funding the D.A.R.E. Program across Southeast Manitoba. Their annual fundraising drive has raised over $100,000 since its beginning in 2000, and continues to grow in revenue each year. The Drug Abuse Resistance Program is a twelve week course offered in classrooms by the RCMP Community Liaison Officer to grade 6 and grade 8 students across the southeast, with more schools requesting the program each year. In 2018, the program saw 1,100 students learn facts on drugs, alcohol, tobacco, anti-bullying, how to be a good citizen, effective communication, effective listening, health networks, and anti-sexting, all while working in collaboration and unity with their classmates. The number of students accessing the program has seen a growth of more than 50% since 2011. While the original start date is hard to pin down, the program was offered sporadically in the region as far back as twenty years ago. The program started with just under 100 students in grade six classrooms participating. The D.A.R.E. program helps equip students during a time when they face many changes and challenges entering the teenage years. Prevention is not easy to measure, but we believe the impact of this program on the youth in our community continues to make a difference. 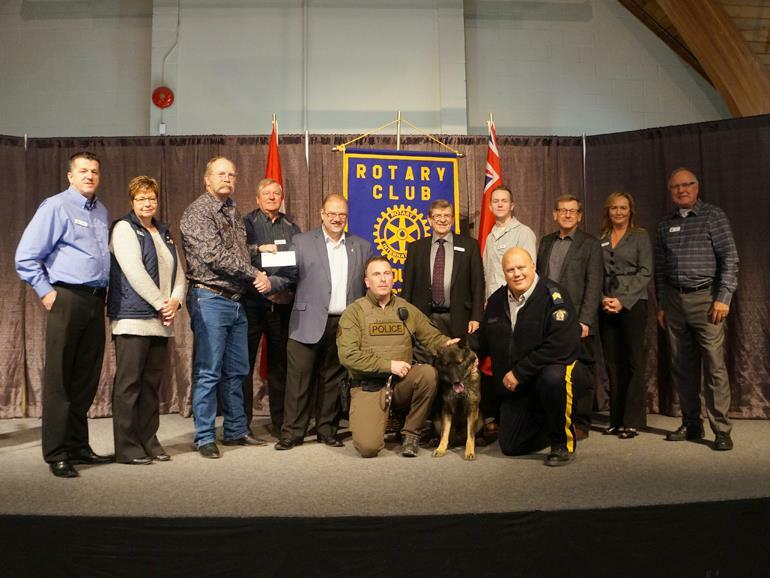 Watch as 2016 MLA Kelvin Goertzen put on protective gear as part of the demonstration and was attacked by Police Dog Enzo as part of the South Eastman Rotary D.A.R.E. Fundraiser. 2017 Club President Corny Petkau ays when the club was founded in the Southeast they were looking for a good cause to support. He notes the RCMP D.A.R.E. program was a perfect fit for the Rotary Club.